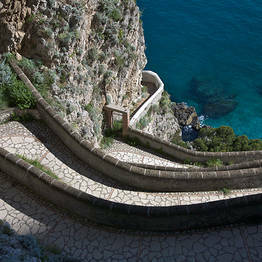 From Italy's most beautiful coastline to its most beautiful island: if you are visiting the Amalfi Coast, you shouldn't miss a day trip to Capri! 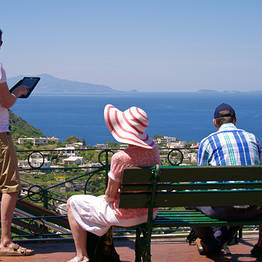 Ferry routes from Positano and Amalfi run from the beginning of April to mid-October. The dates can vary from year to year depending upon the seasonal weather and the date on which Easter falls (which traditionally marks the beginning of the tourist season). 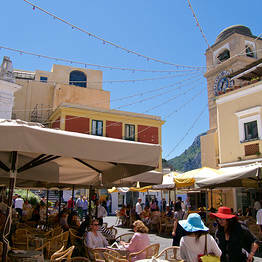 Generally, during the months of April and May there are two ferries which depart each morning from the Amalfi Coast for Capri and two which return in the evening. 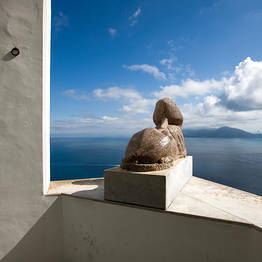 During June, July and August, a third ferry is scheduled in the morning for Capri and in the afternoon for the return route. We suggest booking your ferry ticket online, especially if you are travelling during the weekend or the months of July and August...the high speed ferries are not large and can get crowded! You can also purchase your tickets directly at the port a day or two before you plan to visit. Luggage is allowed on board: one piece of hand luggage is included in the ticket price. There is a surcharge for additional bages. During the winter season from the end of October to the end of March, you must board the high speed or regular ferry from Sorrento. 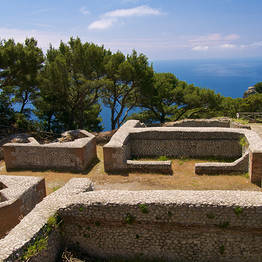 The route between Capri and Sorrento runs all year round. 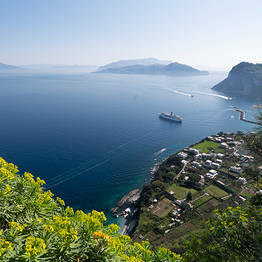 Mini-cruises: you depart on a small ferry with a large group, and sail around the entire island before stopping to disembark on Capri to explore by foot. The average price is EUR 35/person. 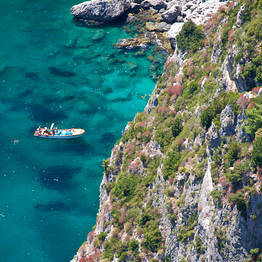 Shared Gozzo: you depart on a traditional wooden "gozzo" boat with a small group. 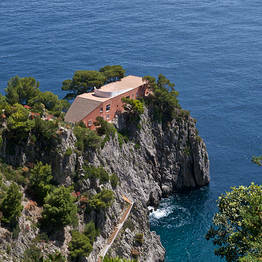 You can stop where you like for a swim and there is a large sundeck to relax and take in the view. 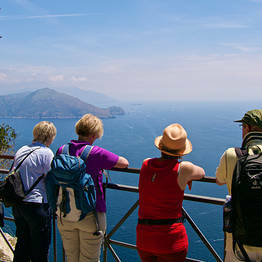 The tour includes a trip around the island with a stop in Marina Piccola where passengers have the option of disembarking to explore the center of Capri on foot or stop for lunch at a seaside restaurant. Snacks and beverages are included. 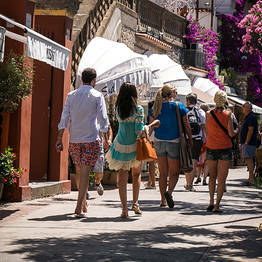 The average price is around EUR 80/person. 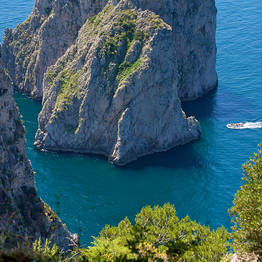 A private boat rental with a skipper is definitely the most unforgettable way to spend the day discovering Capri. Departing from Positano (or one of the other towns along the coast), you can stop off the Li Galli islets where it is said that Ulysses met the Sirens for a swim before continuing on to Capri. 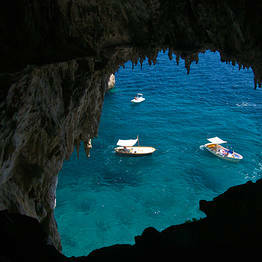 After a stop under the Faraglioni sea stacks, you can have lunch at a seaside restaurant, visit the famous sea caves, and return by way of Punta Campanella and the Bay of Ieranto. The cost of renting a boat with a skipper depends on the type of boat, but prices usually begin at EUR 600 for the entire day per boat (not per person). 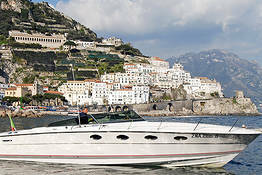 Even if you have a bit of experience at sea, we do not recommend renting a boat without a skipper as the stretch between the Amalfi Coast and Capri can be choppy and windy, so it's best to know the area well. 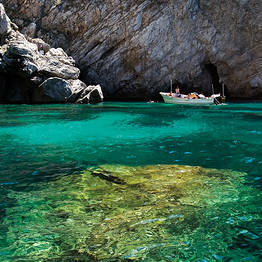 It's also hard to find a spot to moor your boat if you want to disembark on the island if you don't have a skipper. 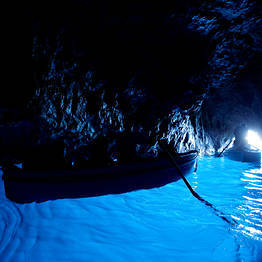 You can also reach Capri by ferry and rent a boat directly on the island, leaving more time to visit on land and save a bit in comparison to a private boat rental from Postianto. 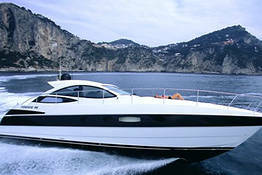 Cruise around the Med on your very own yacht: now that's luxury!